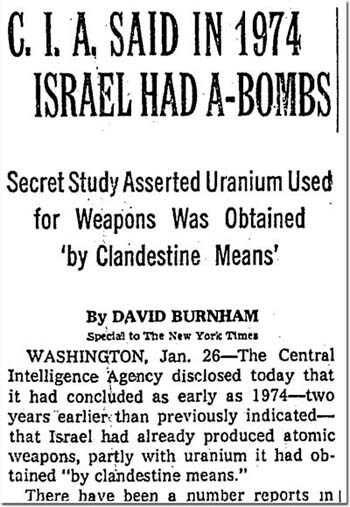 New York Times story from January 26, 1978 on the declassification of the “Summary and Conclusions” of SNIE 4-1-74. "A Look Back Reveals Forward Thinking"
"CIA reveals: We said in 1974 that Israel had nuclear weapons"
Washington, DC, January 14, 2008: In the wake of the Indian "peaceful nuclear explosion" on May 17, 1974 and growing concern about the spread of nuclear weapons capabilities, the U.S. intelligence community prepared a Special National Intelligence Assessment, "Prospects for Further Proliferation of Nuclear Weapons," published today by the National Security Archive. The 1974 Indian test created shock waves in the U.S. government, not only because of its broader implications, but because the intelligence community had failed to detect that it was imminent (This failure led to an intelligence post-mortem.) The possibility that the Indian test might lead to a nuclear arms race in South Asia and create new pressures for nuclear proliferation elsewhere induced the U.S. government, which under Secretary of State Henry Kissinger had treated this problem as a lower-level issue, to begin viewing developing policies to curb proliferation as a higher priority. That the SNIE estimated that "many countries" would have the economic and technological capability to produce nuclear weapons by the 1980s underlined the seriousness of the problem, as did another statement: "Terrorists might attempt theft of either weapons or fissionable materials." Noting that there were over 50,000 nuclear weapons in the world, the report observed that "absolute assurance about future security is impossible." The CIA released the 1974 SNIE in response to a FOIA request by National Security Archive senior fellow Jeffrey Richelson, author of Spying on the Bomb: American Nuclear Intelligence from Nazi Germany to Iran and North Korea (New York: W.W. Norton,2006). Quicker than usual, the CIA posted the SNIE on its Web site before the National Security Archive published the document. In response to the CIA posting, the estimate has already received some play in the U.S. and Israeli press, as well as on www.armscontrolwonk.com. Interestingly, twenty years ago, the CIA released an excised version of the "Summary and Conclusions" of this document in response to a FOIA request by the Natural Resources Defense Council. It became the subject of a front-page story in The New York Times on 26 January 1978, under the headline, "C.I.A. Said in 1974 Israel had A-Bombs." In response to press queries, the CIA stated that the release was a mistake because it included some classified details. Two years ago, the Archive posted an unredacted version of page one of the "Summary," as found in the Joseph Sisco files at the National Archives. Israel:"We believe that Israel already has produced and stockpiled a small number of fission weapons." Republic of China (Taiwan):"We believe facilities are being developed with conscious intent to keep a nuclear weapon option open." South Africa: "In the short run, South Africa is of more concern in the proliferation context as a potential supplier of nuclear materials and technology than as a potential nuclear weapons power." Japan: "Technologically speaking, [Japan] is in a position to produce and test a nuclear device within two or three years," but "the Japanese are unlikely to make a decision to produce nuclear weapons unless there is a major adverse shift in relationships among the major powers." Argentina: "if Buenos Aires dedicated itself to the earliest possible development of a nuclear weapon and received … foreign assistance in building the necessary facilities, Argentina could have an initial device in the early 1980s." This SNIE was the latest in a series of estimates on the nuclear proliferation issues that the intelligence community had been preparing since the late 1950s. In an earlier posting the National Security Archive published all of the available estimates, from 1958 to 1967. While some of the estimates were more heavily excised than others that the CIA had begun to release them in response to declassification requests has been a change for the better, in contrast to the earlier policy of blanket denials. The 1974 SNIE is the subject of a pending appeal by the National Security Archive, which may lead to the release of more details from the estimate. 1. For discussion of the estimates, see Joseph Cirincione, "Lessons Lost: During the Last 60 Years, We Missed Several Opportunities to Contain the Nuclear Threat. It's Not Too Late to Learn From Our Mistakes," The Bulletin of The Atomic Scientists, November-December 2005, 43-53.